Ten Years Later Teaser: Victor Crowley! Victor Crowley – Victor Crowley (Kane Hodder) – Photo courtesy of Dark Sky Films. VICTOR CROWLEY will hit select U.S. theaters in October 2017 as part of Dark Sky Films’ Victor Crowley Road Show. COMICS: Secret Identities: The Asian-American Superhero Anthology – It’s About Time! 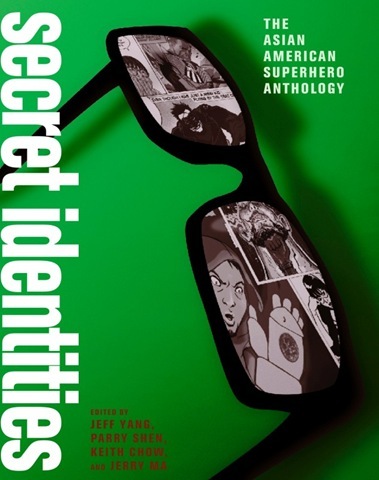 Secret Identities: The Asian-American Superhero Anthology may represent something of a breakthrough. As an ethnicity that both has a rich and powerful tradition and is greatly under-represented in comics [of all genres – not just the superhero one], a number of very talented Asian-American writers, artists and writer/artists have banded together to produce a volume of superhero stories that range from the straightforward superhero yearn to biting satire. If they can’t find superheroes to relate to, they’ll just go ahead and make their own! The brains behind the anthology, Jeff Yang, Parry Shen, Keith Chow and Jerry Ma have collected material from comics pros like Bernard Chang [Wonder Woman], Hellen Jo [Jin & Jan], Greg LaRocque [Legion of Superheroes, The Flash], Dustin Nguyen [Batman: Detective Comics] and Greg Pak [Hulk, the film Robot Stories] and; actors Kelly Hu [The Scorpion King, X2] and Dustin Tri Nguyen [V.I.P., Saigon Eclipse]; members of the filmmaking industry like Benton Jew [formerly with Industrial Light & Magic] and Michael Kang [The Motel, West 32nd], and more than four dozen other contributors [including themselves, of course].